Heaven and hell, it seems, exist here on earth but each in a different dimensional plane. Demons and angels often cross over to our plane to try and influence us mere mortals. They appear not to overtly direct events, but to gently nudge us and take advantage of our natural tendencies towards good and evil. It’s a little bet between the Lord and the Devil – who can influence the most souls. Some humans can see these supernatural beings and when they take too much advantage of our weak souls, someone has to send them back to Hell. 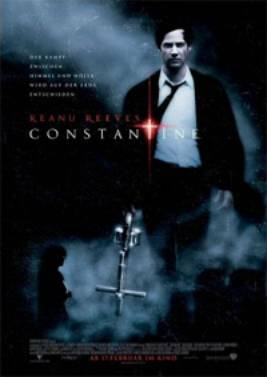 Keanu Reeves stars as a bitter and hardened John Constantine who specializes in demon dispatching, but the trouble for Constantine is that he is dying, and he knows that he’s due for a one-way ticket to Hell, a Hell full of the demons he has previously sent there. And they’re waiting for him. Keanu is great as Constantine. He’s one of those “niche” actors – not a great actor, but find him a good role in his range and he’s terrific. He can obviously handle the action stuff, and he’s very funny with his terrific deadpan delivery, which makes for some divine comedy. And there was a danger for him in this role, as there are some similarities to The Matrix (the idea that our world is not what it seems, and the fact that Constantine shares some wardrobe secrets with Thomas “Neo” Anderson), but Reeves pulls it off. His Constantine is weary, bitter and downtrodden. The rest of the cast doesn’t slouch, either. Rachel Weisz is fine as Angela, whose sister’s suicide is a portent of encroaching evil. And Peter Stomare is just totally off the wall as, well, let’s just say as someone you better hope you never meet. The special effects are solid but the film does not rely on endless digital creatures to tell its story. It’s not a monster movie in that sense, but it is spooky and creepy, and downright strange at some points. And it’s funny, too, thanks to Reeves’ deadpan, but thankfully he never devolves into the one-note catchphrase “witticisms” of other action movie heroes. First time director Francis Lawrence does a decent job here, mixing in the humour with the strangeness and a touch of film noire, but never overpowering the actors with effects or a drowning goth-rock score as might have been a temptation. The movie starts a little shakily; there are some moments that are a little confusing and hard to fathom at first, but everything soon fits into place and rides smoothly. The script isn’t spoon-fed to the audience, either. You need to pay attention. I can’t say how it compares to the original comic series as I’ve never read it, but I know some fans were put off by Constantine’s transformation from British to American for the movie. However, if fans are willing to overlook that transgression, Constantine is a solid film and well worth a look. Originally published in Neo-opsis #6, 2005.